Here we go!! My monthly reflection of everything I did, how much I got paid and my successes and struggles as a fairly newish blogger. 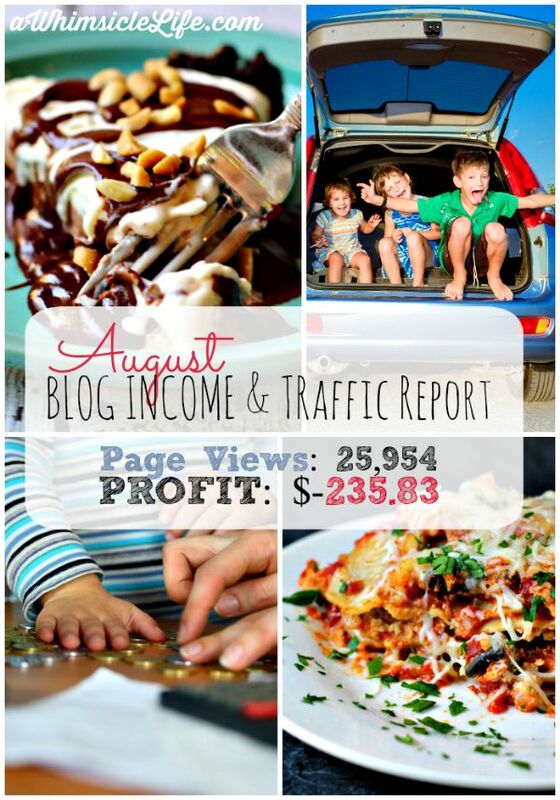 For those who are new to my income reports, welcome! I’ve been blogging for a year and a half and I am now starting to see results! This month focuses on learning about my audience, bad decisions and how I have no control over Pinterest. The way to increased page views is through amazing content. Bloggers need to know what their readers respond to and what they share regularly. Thank you to the Elite Blogging Academy for teaching me that! Problem is, that’s a really hard task. If someone asked me what I liked and I would love to read, I honestly wouldn’t know what to say. A publisher’s job is to figure out a pattern. One of the ways to do this is by viewing my top posts each month and seeing how much each post has been shared. From this, I see that 3 of the posts are useful information of what to do with kids. Road Trip Games, On Bed Rest and Teach Kids How to Pack their own Lunch also solve problems for the reader. How do I keep my kids entertained in the car? What do I do with my toddler if I’m on bed rest? The popularity of the lasagna and the frozen custard pie I think are due to the pictures. Both are drool worthy and the kind of images I pin on Pinterest but don’t click on. Neither one of these food posts have many people clicking through to read the post. That’s an issue since I want traffic to my site. Going forward this month, I am looking for problems I can solve for my reader. I’m paying close attention to my facebook feed to see what people are struggling with in regards to their family and children and creating content from that information. Oh… being a business owner is tough. Good news first, page views were up! On August 11, a large Facebook site with a very large UK audience shared my DIY Kid’s Travel Art Kit post and I received a huge amount of traffic. I wish I knew who shared it so I can thank them! All I know was that Facebook referrals went through the roof that day as did people clicking from the United Kingdom. Here’s the overview of the month. Now… the bad news. Ohhhhh, I made a bad choice in spending. I decided to try out Sumo Me list Builder for the 2 week free trial. It allowed me to customize my email pop-up with images and cooler graphics. I thought it would entice more people to sign up for my emails, because lately my sign up rate has plummeted. The list builder Premium didn’t help and I forgot to cancel in time so my credit card was charged. My plan now is to figure out how I can use this List builder to my advantage. I’m researching everything I can about email list building and going to apply what I learned. Honestly, I think it’s the freebie I’m offering right now. My e-book is geared towards summer activities and while the weather is technically still summer, people just aren’t in that frame of mind. I need to create another subscriber incentive. By the way, my emails are good! I have a 23% open rate which is above the industry average of 18%. I write original content for the emails and they are bit more personal than the blog. Don’t you want to sign up for my email? Pinterest is still a huge traffic source for me. They changed their algorithm recently and I wanted to cry. My traffic dropped by about 200 page views a day. It makes a huge difference and I’m trying to recover by boosting my Facebook presence, getting on Periscope and working Instagram. As a business, it’s never good to have all of your traffic or income come from one source. If that one source disappears you are finished. Diversifying is key.